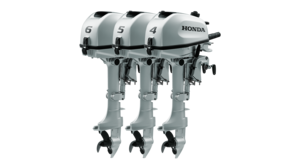 Seamless performance and optimum power are what you get from the cutting edge 4-stroke technology in these Honda outboards. 50 years of Honda automotive engine research and innovation clearly haven’t gone to waste then. Our unique lean-burn control ECOmo system adjusts the fuel to air ratio depending on load and speed to improve your fuel consumption when cruising. When your boat is up on the plane and cruising, the PGM-FI system can adjust the air/fuel ratio up to 20% by making the mixture leaner. The High Output alternator delivers a solid 55A, which will keep a battery with a 40A charging capacity in top condition; and it’ll keep all your on board electronic equipment powered up too. 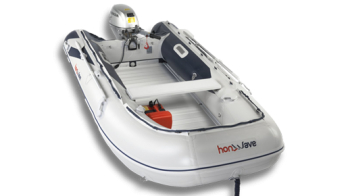 The BF135 is joined by the BF115 & BF150 with the same 2.4 litre PGM-Fi engine with a range of horsepower options for different-sized boats. Up to the minute technology combines Honda’s unique three-way cooling system with dual air-intake. And when you add Hole Shot technology BLAST™, it really gets you up and skimming along. On the BF150 we’ve added VTEC™, an advanced racing innovation for more torque and that extra push at higher revs. We didn’t stop there either. We’ve included ECOmo lean burn control to make these outboards the very best in class for economy and low emissions. Combined with Honda’s world-renowned reputation for reliability, you can be safe in the knowledge that they will never let you down. Whether you’ve got a speedboat or a larger vessel – choose any one of theses engines and you’ll enjoy optimum power wherever you go. Sit back and listen to the sound of the sea as you cut through the water. From the BF115 and BF135, to the BF150 – these engines are fine-tuned to deliver more horsepower for a large range of different boats. The smooth power this advanced technology provides will certainly keep you smiling as you head out into the blue. 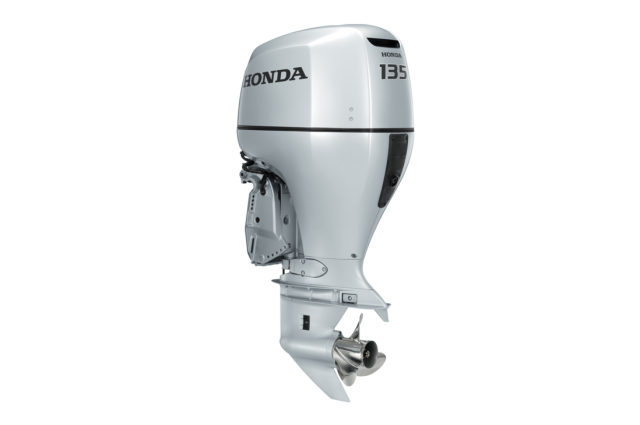 These engines have a bright silver body with sleek aerodynamic styling and a superior, hydrodynamic-designed gear case for better underwater performance at high speed. Functional design: Cloaked in a tough and extremely resilient finish, these engines look great. And in the water, reflecting all the colours around them, they look even better. But they have a job to do – we know good looks aren’t everything – and they more than deliver. They’re perfect for a dual installation because their slim design allows them to operate closely together. A high output, belt-driven alternator supplies excellent battery charging – even at trolling speeds. So if your NMEA2000® is connected, you’ll have more than enough power to support it.